BBC One, ITV1 and Channel 4 are to be broadcast to mobile phones as part of a mobile TV service launched by BT. BT Movio will offer BBC One, ITV1 and E4 live - but with some films, sport and US shows removed from the line-ups. Channel 4 will broadcast a slimmed-down version of its schedule at first. BT Movio will initially be available through Virgin Mobile from 1 October. The service will be the first to be broadcast via the DAB digital radio network instead of the 3G phone system. It will also offer up to 50 DAB digital radio stations, depending on location, BT said. The company added that it was the first time BBC One and E4 will be beamed to mobiles, allowing viewers to watch most programmes at the same time as they are on normal TV. 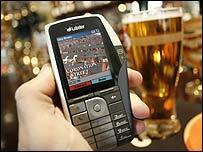 The service will be launched on the new Virgin Mobile Lobster 700TV phone. Customers on contracts costing £25 or more per month with the company will get the phone and TV service for free. Otherwise, the handset will cost £199, with subscription to the TV and radio package offered free for the first three months and £5 a month thereafter. BBC One will be part of the service for 12 months on a trial basis and will be provided for free. Other phone operators are also expected to start offering the package - which is the latest step in the move towards mobile viewing. ITV1 has just started broadcasting live to mobiles via the 3 network, while Vodafone and Orange offer services carrying a range of TV channels. Virgin Mobile managing director Alan Gow said: "We are really excited to be able to offer our customers the same brands and high quality of programming that they expect on their television at home." In May, people who watch programmes on mobile phones or computers were told they needed a TV licence to do so. Otherwise, they may face fines of £1,000 because the broadcasts are governed by the same rules as traditional television sets, TV Licensing said.